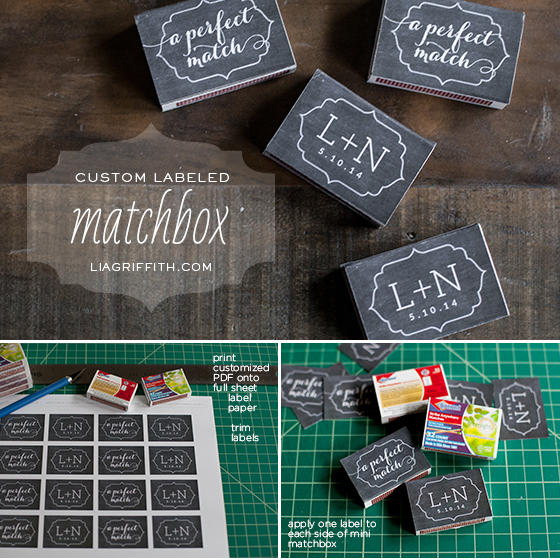 Last year I posted a printable matchbox label with inspiring words and an editable monogram. Remember these? I have had so many requests for a personalized version for wedding favors and events that I decided to create this new design perfect for the occasion. 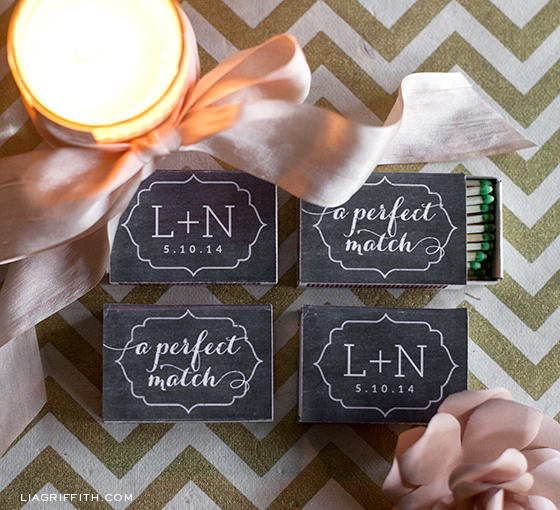 The most requested for wedding favors are the words “a perfect match” and bride and groom’s initials and wedding date combo. 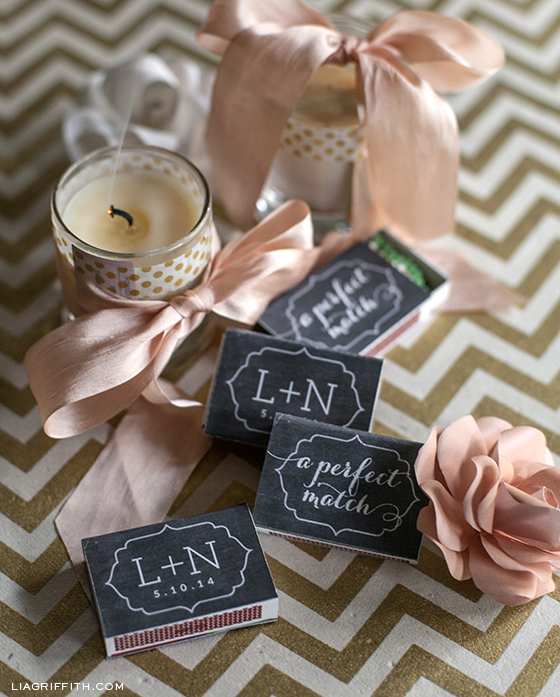 This version is easily personalized for bridal showers and weddings. I am often asked what kind of matchboxes to buy. I like the mini Diamond boxes that come in a pack of 10 for $1.50 that I buy at my grocery store. Below is a quick tutorial on the easy steps for this adorable and affordable favor. The dimensions are approximately 2.125″ x 1.5″ or 3.5cm x 5.25cm. Before you edit the matchbox template, be sure to download and install the free font Aleo. Print the template on full-sheet label paper, and then cut each side individually. Enjoy! How did you get the white to print on black label paper? The label paper is white, so the chalkboard print is what’s printed (and the white is just the paper color showing through). I cant seem to be able to buy the correct size labels so these fit. Any other options besides 2 sided tape? Make sure the font is installed properly, and that you’re only inputting 2 letters (unfortunately you’re limited to just the 2). Love these! And I can’t believe how easy this is to do! How can I change the initials on the template? Once you have the correct font installed, download the PDF and you’ll then be able to edit the monogram. (You won’t be able to do this correctly in a web browser, so be sure you download the PDF to your computer). How do you apply them to the match box? If you print on label paper, you can apply them like a sticker. If you print on regular paper, double-stick tape or a glue stick works! Hi! I was also interested in the download, but it says your Etsy shop is taking a short break. Is it possible to get the download another way? Hi, my Etsy shop is back up! Lia, I am looking for something exactly like this but you no longer have the listing on etsy. Any help on where I can find something like this 🙂 Thanks! Hi Kara, The matchbox wedding favors should still be on Etsy but I noticed that my shop is down for some reason so I am going to call them right away. 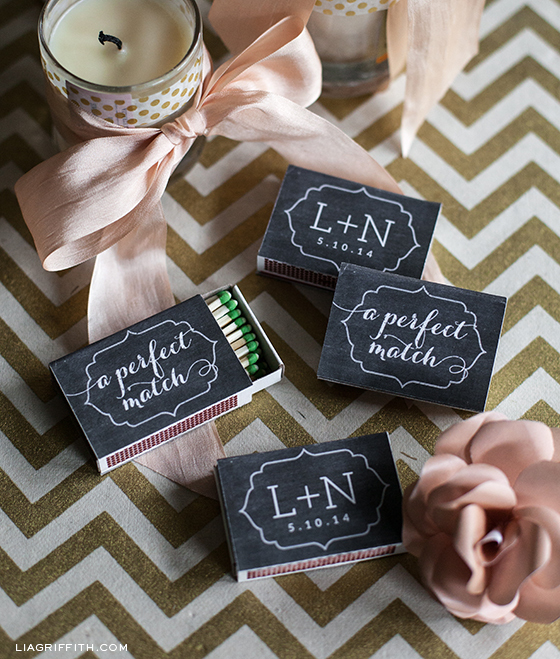 I am so happy I found your website as I have had the idea to do match boxes for my wedding for quite sometime. I am from South Africa and so will be buying the match boxes here (I looked on Amazon but they are about $4 more expensive than South Africa’s matches per box of 10!). I just wanted to know if you know the dimensions of the diamond match boxes so that I can make sure your labels will fit the match boxes I will buy here in South Africa. They are 2 1/8 by 1 1/4 inches, which is 53 x38 mm (if I did my math right). Also, I offer custom in my Etsy shop.